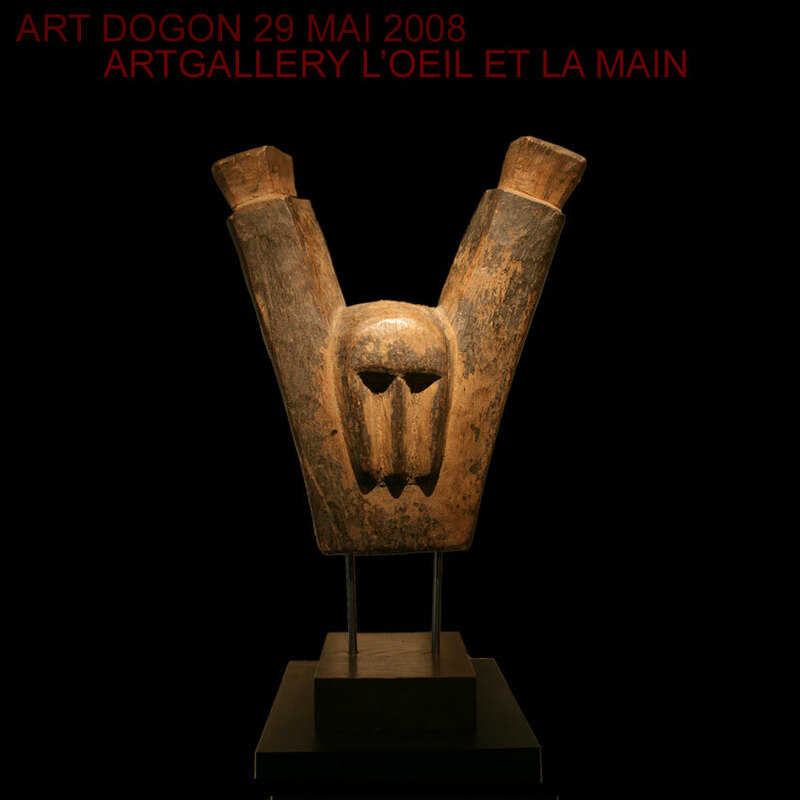 In addition to these sculptures, the achievements are more typical of Dogon masks dance. One of their ritual, the sigui, held every sixty years. It is intended for the expiation of sins and this anthropomorphic or zoomorphic masks (antelope, rabbit, buffalo, monkey, bird, hyena, lion) very large in size (up to ten meters to the mask-snake). The mask snake is the symbol of the dead ancestor. It is performed on this occasion. The whole community participates in the ceremony. The insiders must keep and are considered responsible for the soul of the ancestor. We also have knowledge of shutters or doors Dogon, they closed their barns and are very interesting because they represent the ancestors. The sculptures are highly stylized. Dogonssont the people of Mali, West Africa. Their population is estimated at 700 000. They occupy the region from the Bandiagara escarpment to the southwest of the Niger bend. Some Dogon are located in northern Burkina Faso, while others have settled in Côte d'Ivoire. The Dogon are mainly farmers (mainly millet) and blacksmiths. They are known for their sculptures and their cosmogony. The language spoken by the Dogon is the Dogon which includes several dialects. There is also a secret language, the sigi so, language reserved for the society of masks. The Dogon are associated with the ethnicity of Bozo the joking relationship. Dogon and Bozo laugh at each other but in parallel must assist. The cliff Bandiagaraest a long chain of sandstone stretching from south to north-easterly for a distance of 200 km and extended by the massive Gandamia himself ended by Mount Hombori, the highest summit in Mali (with 1155 meters). This is one of the most impressive sites of West Africa, whether through its archaeological, ethnological and geological. Part of the cliffs are located in the neighboring country of Burkina Faso. In the rocky wall of a corridor named toloyet located near Sangha, a cave has yielded the earliest evidence of human occupation: granaries made of stacked rolls of clay, pottery and plant remains, dating from the third and IIesiècles BCE. This phase is called cultural toloy. Thirteen centuries later, these barns were reused by the Tellem. In the sides of the cliff lived in the cave Tellem, an ethnic group of hunter-gatherers who left the cliff following the arrival of the Dogon and environmental changes brought about by lifestyle farmers. Dozens of villages are situated along the cliff like Kani Bonzon Sangha or where the Dogon people arrived in the fourteenth century. The Dogon Tellem preserved buildings, and developed their villages below sites Tellem.